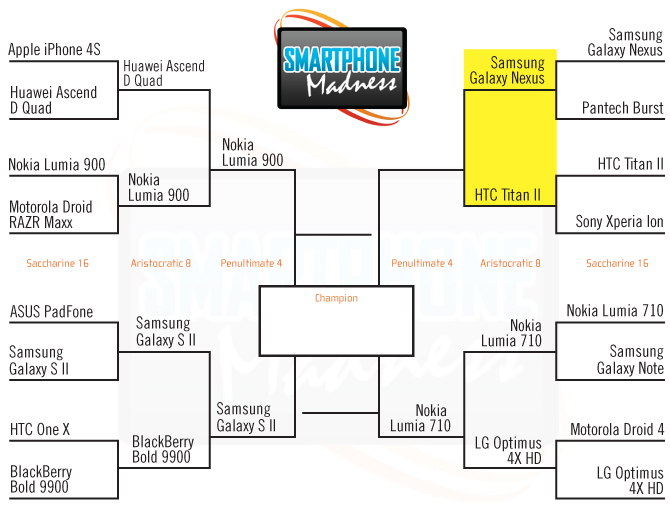 As of this moment, the Galaxy Nexus is getting crushed in Laptop Mag’s Smartphone Madness bracket by none other than the HTC Titan II. Pretty sure that is a Windows Phone, yeah it is. Probably the same one that got “smoked” over the weekend by a G-Nex at one of Microsoft’s stores. So let’s show Windows Phone again how good this Nexus is and rack up some votes over there. Otherwise, we may be stuck with a bunch of phones with a “gorgeous UI” that no one will ever buy, battling it out with the Galaxy SII for smartphone supremacy. At the time of this posting (12:19PM Pacific), we are about 900 votes down. Go get ’em DL community. Update: In about an hour and a half, we were able to erase that 900 vote lead and jump up by 1,600 votes. Keep crackin’ away at it though, we don’t want a comeback by an unreleased Windows Phone. Vote at Laptop Mag’s site. Cheers Timm Eddy and Pinocchio!